6 weeks ago, Steve contacted me as he wanted to revise his approach to training. Steve is an ex rugby player. His true passion for rugby was clear within 5 minutes of meeting him! Unfortunately the game had left him with several injuries which had caused limitations & pain in his current day training. The goal was to get Steve moving as painfree as possible, to introduce him to a revised way of training & above all else ensure that he has a laugh along the way! So far we have achieved success! However, recently, completely out the blue, Steve REALLY surprised me…. 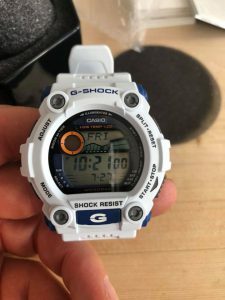 He gave me a G shock watch! So he thought he’d get me one, as he’s enjoyed our sessions so much! (He did add it was a little “thanks for the pain” memento ). I’m sharing this with you not to brag, but to simply highlight how one random act of kindness can totally change your day! I was and still am quite taken back by Steve’s gesture. Got me thinking, and I know this sounds MEGA CHEESEY, but if we all did one random act of kindness the world would be a far better place…. 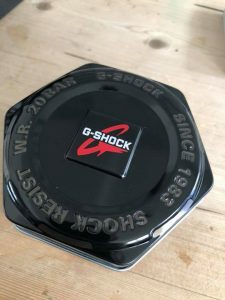 Tristan ‘still in G shock’ Buttle.